Each member of our team at Select Automotive in Virginia Beach know what a quality luxury vehicle looks and feels like. When selecting a luxury car, we're here to help you find the right set of features so that you can be comfortable on the road ahead. 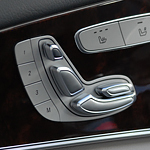 When you step inside the Mercedes-Benz E 450 4MATIC Wagon, the power front seats will remember your driver settings. It features a memory function that can save up to three settings. For added comfort, you have the option of adding a massage function as well. The dual-zone climate control setting lets both the driver and front passenger enjoy comfort in their way. Just set the temperatures individually, and the Mercedes-Benz E 450 4MATIC will automatically adjust the settings to keep the set temperature. An integrated dust and pollen filter help to ensure that air entering the cabin is clean as well.